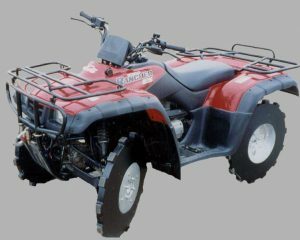 Just bolt the wheels to your ATV and drive through wet areas, making V-shaped trench tracks to drain surface water and save your crop.Track depth is partially dependent upon the weight of the vehicle and operator. 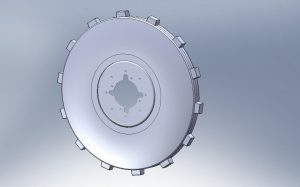 “Deeper trenches can be achieved by simply retracing your tracks,” advises Steve Raguse, designer of the Trench Wheel. Retrace tracks by driving forward or driving through wet areas then shifting into reverse and backing out. 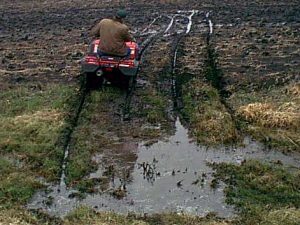 Deeper trench tracks can also be made by driving to the right or left of original tracks, retracing with wheels on one side of the ATV. New “Convert-a-Hub” bolt pattern plates adapt Trench Wheels to various ATV lug bolt patterns. Aggressive solid steel lugs on the outer bead face provide positive traction and are self-cleaning in muddy and/or high residue conditions. The trench wheel tracks are handy markers to map out Fall ditching after harvest. 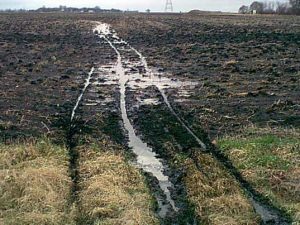 “Trench Wheels are equally valuable in dry crop conditions where heavy rainfall on hard, compacted soil causes standing water that must be drained or contained quickly to prevent crop loss,” Raguse emphasizes. 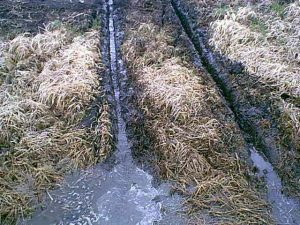 “The low cost of Trench Wheels is cheap insurance to save your crop from damage due to standing water. Trench Wheels is a “Smart Tool” you can use many times a year to manage surface water problems.” Buy a set of wheels; be ready when it rains! 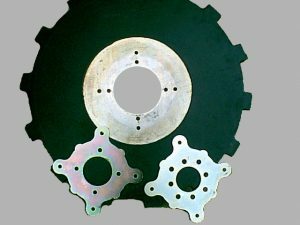 To purchase, contact Rust Sales, Inc. by calling 800-478-7801.